Tell me what you wear…. And I will tell you who you are? In our world of infinite fashion choices, judging a person solely on the one outfit we see him or her wear first would be simplistic. But can we deny the strength of our projected appearance, on others as well as on ourselves? In September 2015, in a much-commented gesture, the Chinese prime minister Xi Jinping wore a modern reinterpretation of the Mao military suit at a black-tie-only state dinner, at the White House. Far beyond his personal preference, his dress choice displayed a China clearly rooted in its communist past. This modern example shows that fashion is losing its label as a vain and frivolous endeavor, and is now gaining its academic credits to become a true field of research for sociologists, historians, and psychologists. 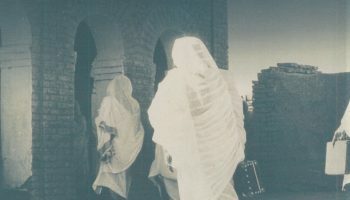 Following Barthes and his “semiology of clothing”, researchers such as Philippe Bruneau and Pierre-Yves Ballut have argued for a true “archaeology of clothing”. Based on the theory of mediation, their work encourages us to look at past garments as witnesses and actors of social processes. A garment found on an archaeological site isn’t a sum of threads and techniques, but the result of a two-ways communication between the wearer and the viewer. Within this relationship, a garment can tell us much about the construction of a person’s identity as an individual and as part of a group. Furthermore, this process is in constant renegotiation, as differences in social time lead to different sartorial needs. Put into simple questions, it means that upon looking at ancient textiles, an archaeologist should ask him/herself “Who was wearing it and when?”, “Who was seeing it?”, and “What message does it convey?”. Usually, these questions remain very hard to answer, because of the fragmentary nature of the remains and the difficulty to reach any level of understanding of past-humans daily life. Fortunately, every so often, a site offers a rare glimpse into the clothing traditions of a population. This is exactly what led me to Toronto, to the Royal Ontario Museum: study the well preserved textiles discovered on the Lower Nubian site of Gebel Adda. 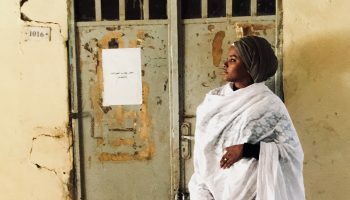 Covering a very long period of Nubian history, from the Late Meroitic to the Ottoman periods, the many garments found in the town’s surrounding cemeteries show the evolution of costume through crucial historical changes. 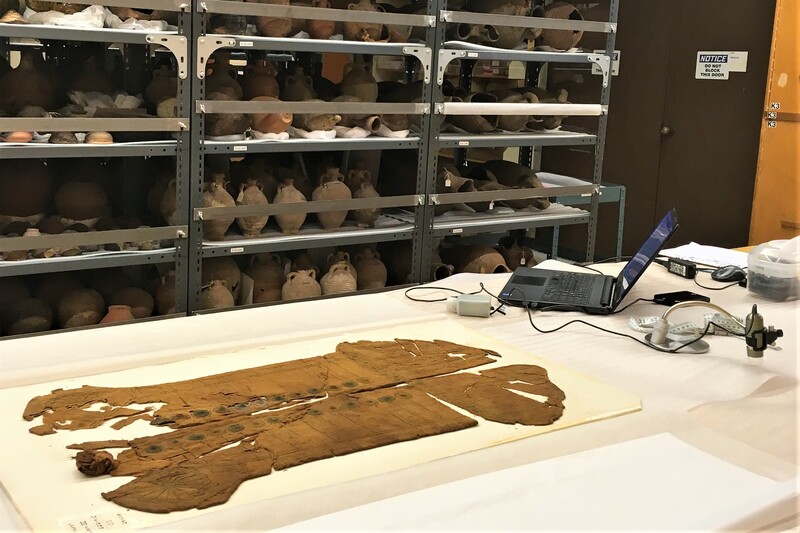 My study focused on the Meroitic and Postmeroitic textiles, today expertly rehoused among the site’s other antiquities, thanks to the joint efforts of the Textile Conservation Lab and Cheryl Copson, Collection Technician in the Egypt and West Asian collections. 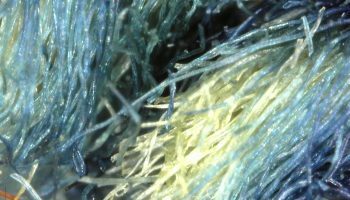 After analyzing 58 textiles in hundreds of fragments, the first thing that jumps to the eyes is a sharp shift in the use of raw material and their associated techniques. When Classic and Late Meroitic textiles are made primarily of cotton, in shades of blue and white, with embroideries and tapestry patterns, the Postmeroitic ones are made of wool and mainly decorated with polychrome tapestry bands. The Postmeroitic weavers also developed a taste for “3D weaving”, adding extra wefts (broché) of larger caliber and knotted pile. This drastic evolution is very meaningful, as it had ramifications in the economic system and craft networks of the times. But what is particularly interesting in our present discussion on dress, is that these technological innovations are concomitant with noticeable changes in the local fashion. It is particularly well attested in the male elite costume. 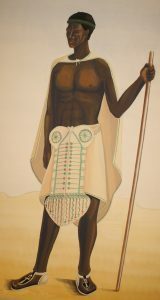 When local nobles were related to the royal power at Meroe, their costume was made of a large cotton loincloth covered by an ornamental apron on the front. 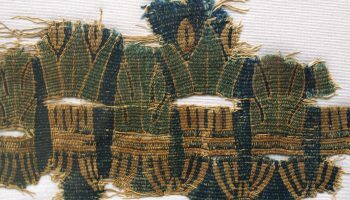 Both pieces, inherited from the Pharaonic and Kushite princely costume, were decorated with blue embroideries typical of the Meroitic style. 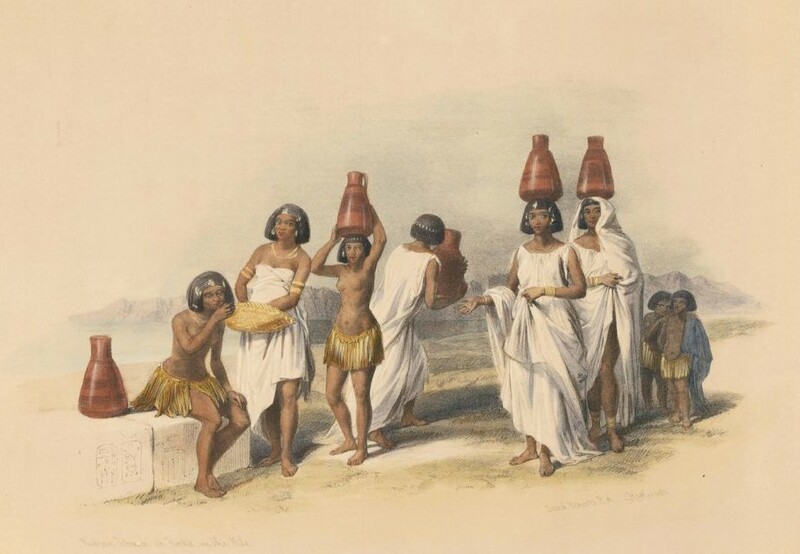 But when Nubia became an independent kingdom, the same nobles abandoned their previous uniform and adopted the Mediterranean tunics and mantles worn by their Egyptian neighbors. This sketch, as rough and preliminary as it is, draws the lines of a clear evolution of fashion in response to deep political changes. Visible all throughout Nubia, it is particularly well illustrated at Gebel Adda. As my study progresses, I hope to show that textiles can be very good markers of cultural identity, in a region in constant redefinition. Note: The first results of my study on Gebel Adda’s textiles will soon be presented in Paris (ISNS conference) and partially published in an article in Routes de l’Orient, Actualités des recherches archéologiques françaises au Soudan (eds. M. Maillot & G. Choimet).